This was one of the yachts I was particularly keen on taking a look at during Cannes Yachting Festival 2017 – not just because of my job but more because of the big talk that was going on prior launching of the all-new Beneteau OCEANIS 51.1 by the market leader. 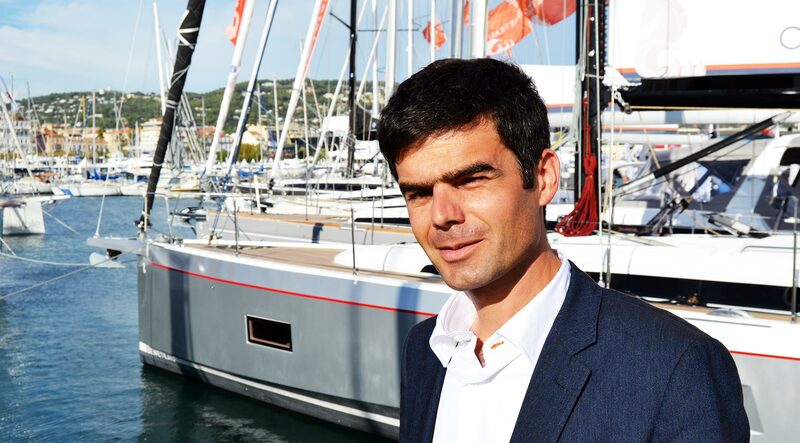 Since Gianguido Girotti took over Product Management of Beneteau early this year a massive re-design effort has been going on and there is virtually no yacht of both sailing and motor yachts that won´t be affected. The new OCEANIS 51.1 is the latest launch of the French yard and there is one detail I found particularly interesting: The hull design with chines. Well, chines are around in yacht design since decades now and there are numerous designs out there but as far as I know there is no yacht at all that bears the OCEANIS´s chine-configuration: Take a look at her bow and you might notice that the chines are setting in right behind the stem and go along all the freeboard to the stern. I was lucky to grad Damien Jacob, Product Manager at Beneteau and one principal figure in the OCEANIS 51.1 design team who was cheerfully answering my questions about this unusual chines-design. This is creating huge volumes inside. 40 cm gain in width. To either side! 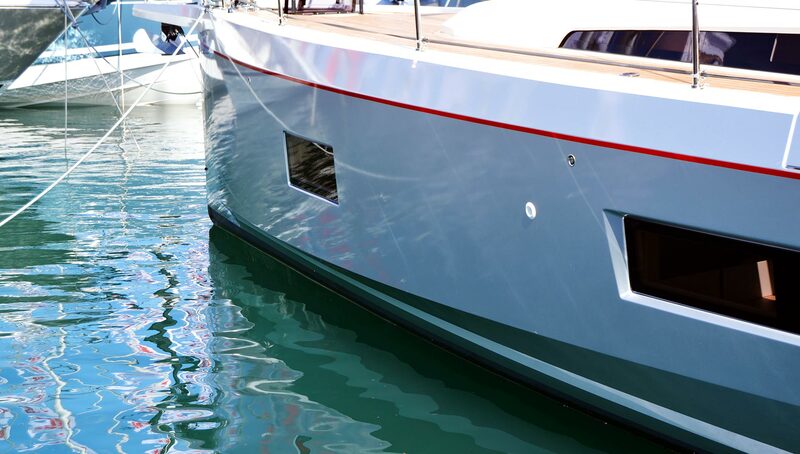 The hull itself when it comes to wetted surface is rounded and slightly V-shaped. Just some centimetres above the waterline the chines set in. 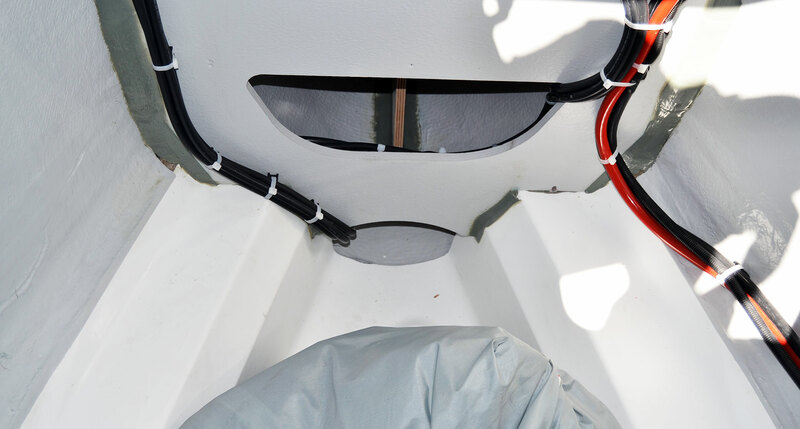 Here in the anchor and chain locker one can directly see the result: Large voluminous parts of the hull are “created” with some 40 centimetres to either side of the boat. I can also imagine that in a breeze, when this boat starts heeling, these large chines will provide for smooth directional stability – I´d love to sail her one time! Now let´s see if Damien´s promise of big internal volume was honest. By checking the size of the cabins I need data to compare it with. 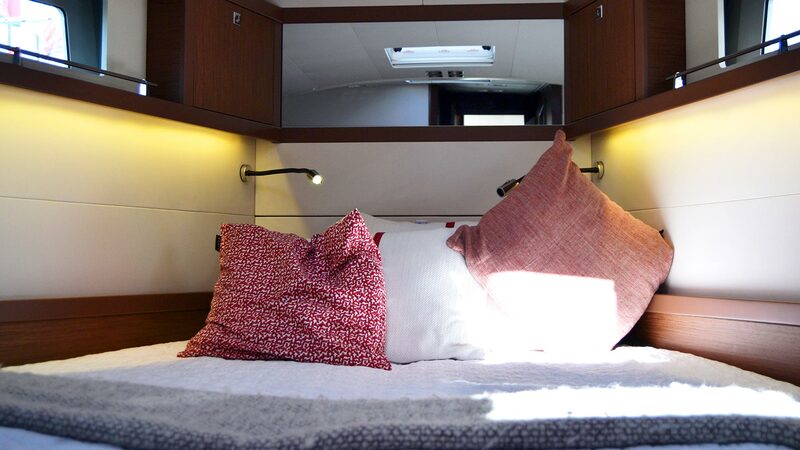 So I went into the Beneteau SENSE 51 which is marketed as a luxurious and spacious cruising boat. 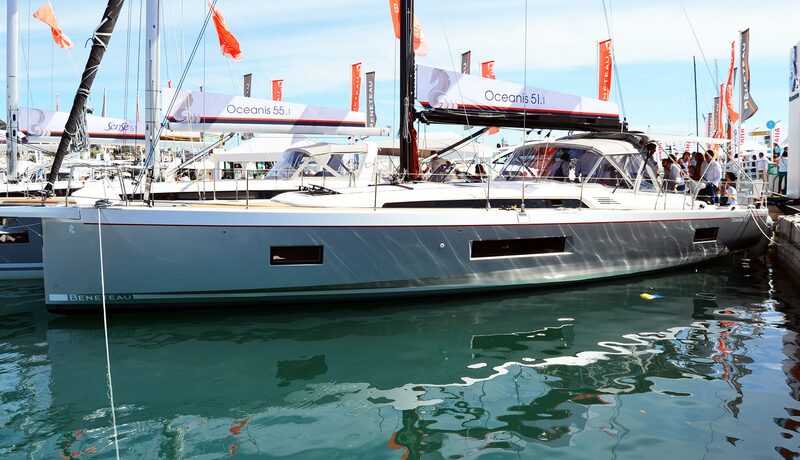 I also heard one of the Beneteau Dealers at the Boat Show advertising this yacht as being the “monohull between the multihulls” for her large sized saloons and cabins. So I went aboard and got straight into the front cabin. It was reasonably sized for sure. A large island bed, plenty of stowage and nice portholes for lots of natural light. I personally wouldn´t have fitted her with such dark timber but that´s a question of taste. For a 51 feet yacht, the SENSE´s front cabin seemed pretty sufficient. Then I changed the boat and aimed for the new OCEANIS 51.1 – and guess what, by direct comparison the difference couldn´t have been much bigger. 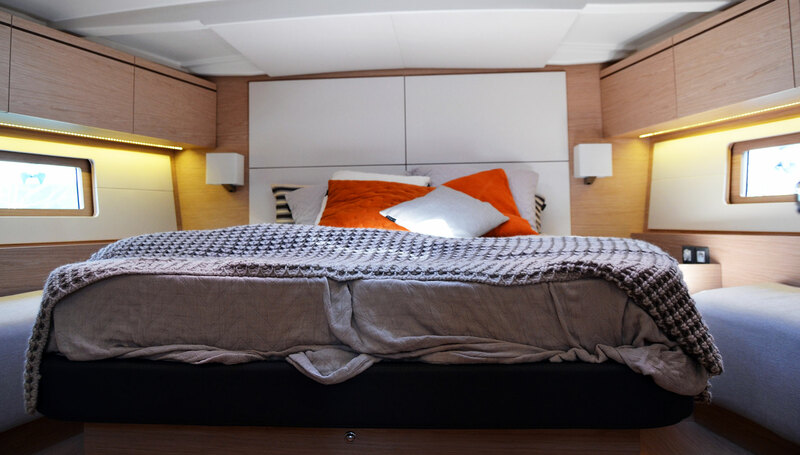 With one word – the fron cabin of the OCEANIS 51.1 is just awe inspiringly huge! I would dare to state that the width of the cabin right at the bulkhead appeared to be doubled! So this is the outcome of adding chines starting right at the stem going back all the way to the stern. The OCEANIS 51.1 offers a grade of internal volume I honestly haven´t seen on other yachts this size so far. By talking to journalists who sailed the boat I´ve got an overall confirmation of Damien Jacobs statements about the sailing abilities of the new Beneteau. In the end, this yacht finally really is something new at the show and judging by the crowds of people constantly forming newer and longer queues to get inside Beneteau seemed to really have landed a big punch. Thanks indeed for this very interesting interview and comparison with the Sense 51. I’m myself trying to benchmark those two models so spot on. Wondering though if the Oceanis might be more intimidating for beginners as the Sense has been set not to lean too much for instance. I don’t catch what meant Damien by people avoid sailing upwind, surely he meant full beam, didn’t he? thanks for commenting. The 51.1 is a dream yacht, for sure. I was visiting the OCEANIS 51.1 production this week in France at Beneteau and I am currently working on an article on the 51.1 in the yard. Yes, he meant that people avoid going upwind these days. I understand Damien’s comments regarding form stability reducing the need for heavy ballast in the context of initial resistance to heeling. However, it appears to me that ultimately positive range of stability has to suffer in such a beamy hull with small ballast. I have not seen numbers posted for positive range of stability in the Oceanis line, but I suspect they would be pretty stable upside down. Is this not just another example of a trend toward compromised seaworthiness at the expense of fashion? One would presume that upside down stability would be an issue. However, the stability index shows that this boat will right itself within three minutes in order to achieve it’s CE A rating. It’s important to understand that these boats are not going to turn turtle in a protected bay where the ballast would sit upright–they will only go over in heavy seas–and the very same seas that turn them over will rotate them enough for the ballast to take over and right the boat.